The Grand Mayan Acapulco in Acapulco, Mexico - Buy a 7 Night Stay in Grand Master Room! 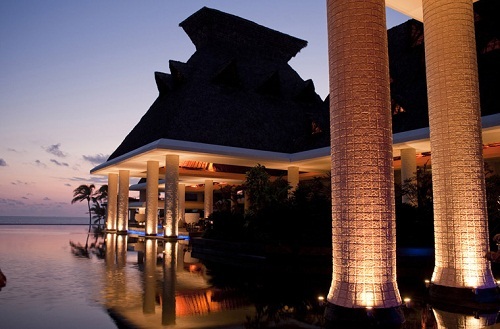 Enjoy 7 Nights at The Grand Mayan Acapulco in Acapulco, Mexico! The resort charges a $10 per adult over 12 years old per day resort fee and a $5 per child ages 2-11 per day resort fee at check-in for all international travelers. If you are a Mexican resident please contact the resort directly for resort fee information. An oasis for families with children, The Grand Mayan Acapulco thrills those of all ages with the on-site aqua park, which features waterfalls, slides, toboggans, hanging bridges and the always crowd-pleasing “Slow Magic River” that flows through the entire park. Sports, cultural activities and crafts await children four to 11 in the Chispa Kids’ Club, while those looking for more adult recreation can play a few rounds at the Mayan Resorts Golf Acapulco or relax at the Brio Health Spa. After dark fun can be found at nightly shows that juxtapose magic, fantasy and art. Experience sand, surf and sky in Acapulco. With warm and pleasant temperatures year-round, any time is a good time to visit. There is no shortage of activities in the area: watch the famous cliff divers, take a hot air balloon ride, swim with the dolphins, snorkel with the fish or soak up the Mexican sun. After, head to one of Acapulco’s many renowned restaurants, which offer a variety of high-quality gastronomic experiences. Following dinner, head out on the town to experience the lively nightlife at a beach bar or night club. Enter your sleek and modern Grand Mayan Acapulco room and throw open your curtains. Your view of either the sparkling azure waters or the beautiful, tropical gardens will begin your trip into paradise. The rooms accommodate two to eight people and will suit most families. No matter which room you choose, fall into the plush beds at the end of the day and let the sound of the water lull you into a restful sleep. In your private, spacious room, you will enjoy high-end finishes with a traditional Mexican color palette and native woods. Local artists' work adorns the room. LCD screens and computers accommodate your technological needs. The views are even more stunning from your private, plunge pool on the terrace if it is a Grand Suite or Grand Master Suite you are looking for.